(Photo: © Peter Kenny / Ecumenical News)The former Anglican Archbishop of Cape Town, Desmond Tutu, a Nobel Peace Prize laureate, making a speech in Cape Town on October 8, 2008. On his 85th birthday, Archbishop Emeritus Desmond Tutu said he supports assisted suicide. On that day Oct. 7. The Washington Post carried an op-ed piece signed by Tutu entitled: "Archbishop Desmond Tutu: When my time comes, I want the option of an assisted death." The support was hailed by those campaigning in South Africa who support the right of people being able to chose when they want to die but pro-life group who oppose "assisted suicide" as it is a slippery slope to legalized killing. Tutu wrote, "Now, as I turn 85 Friday, with my life closer to its end than its beginning, I wish to help give people dignity in dying. Just as I have argued firmly for compassion and fairness in life, I believe that terminally ill people should be treated with the same compassion and fairness when it comes to their deaths. "Dying people should have the right to choose how and when they leave Mother Earth. I believe that, alongside the wonderful palliative care that exists, their choices should include a dignified assisted death." Tutu noted, "There have been promising developments as of late in California and Canada , where the law now allows assisted dying for terminally ill people, but there are still many thousands of dying people across the world who are denied their right to die with dignity. Two years ago, I announced the reversal of my lifelong opposition to assisted dying in an op-ed in the Guardian." Tutu has thrown his moral weight behind a campaign in South Africa to change the law so people can choose when to die. The campaign's aim will be to "bring the issue of death and dying to the world stage," South African right-to-die campaigner Sean Davison told the country's Sunday Times Oct. 9. The project will materialize soon and will build on the worldwide publicity generated by Tutu's 85th birthday call for the right to choose when and where he dies, he said. 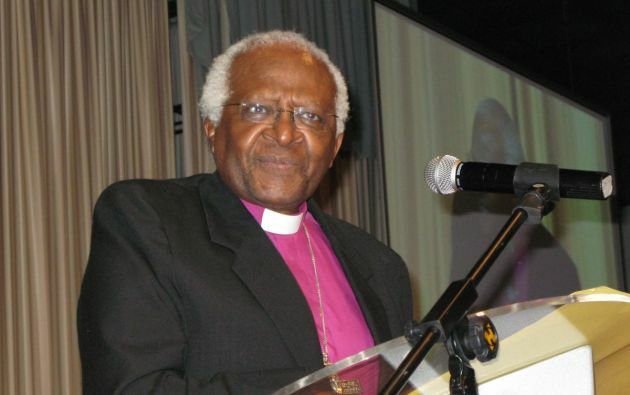 Looking frail, Tutu celebrated his birthday at St. George's Anglican Cathedral. Later, he arrived in a wheelchair at a lecture in his honor at Artscape in Cape Town. He supported Davison and begged the authorities for leniency. "He wrote to the courts in New Zealand to request that I be allowed to return to South Africa on bail until the beginning of my trial," Davison said. "At that time he acknowledged he hadn't thought a lot about ... assisted dying but he knew I acted out of compassion and he knew how much my mother was suffering." Tutu wrote in the Washington Post, "I believe in the sanctity of life. I know that we will all die and that death is a part of life. Terminally ill people have control over their lives, so why should they be refused control over their deaths? Why are so many instead forced to endure terrible pain and suffering against their wishes? "I have prepared for my death and have made it clear that I do not wish to be kept alive at all costs. I hope I am treated with compassion and allowed to pass on to the next phase of life's journey in the manner of my choice." Vaughan Luck, spokesman for Doctors for Life in South Africa views choosing death differently and deplored Tutu's support for what he said is "assisted suicide." "I can't understand the reasoning behind it and I completely disagree with it," Luck told the Sunday Times in South Africa. Luck said assisted dying could open the floodgates for a litany of wrongs including the "assisted suicide of children." He used Belgium as an example. "You end up in a state like Belgium, which euthanized the first [17-year-old] just a couple of weeks ago. This child was suffering with depression, not coping with everything that happened to it, so they decided the best thing is to euthanize it."